Hello all! Are you sick of me addressing you in the same manner at the start of every post yet? I was considering switching things up a bit and trying 'Hello Everyone', but I am not sure I am ready for it... I am a creature of repetition in many ways. Moving on from that, I apologise for committing the sneaky outfit repeat sin here, I know you have all seen this one already. I just prefer the light in these versions and so thought I would share them! I am also happy to tell you that I am now officially www.ArabellaG.com rather than .blogspot! It vexes me slightly that plain old Arabella.com was taken so I had to stick the G on the end, resulting in Arabellag looking like one strange, long word. No matter though, I am content! I have also been thinking, how would you feel about a 'Wardrobe Tour' post? I always ADORE seeing into other people's wardrobes and having a nosey round, so perhaps you would also enjoy seeing into mine! Let me know! wardrobe tour im also nosey! Beautiful outfit, love the colour of the blouse! This is such a lovely look! So retro and beautiful! I'd love to see inside your wardrobe! You always look so lovely! 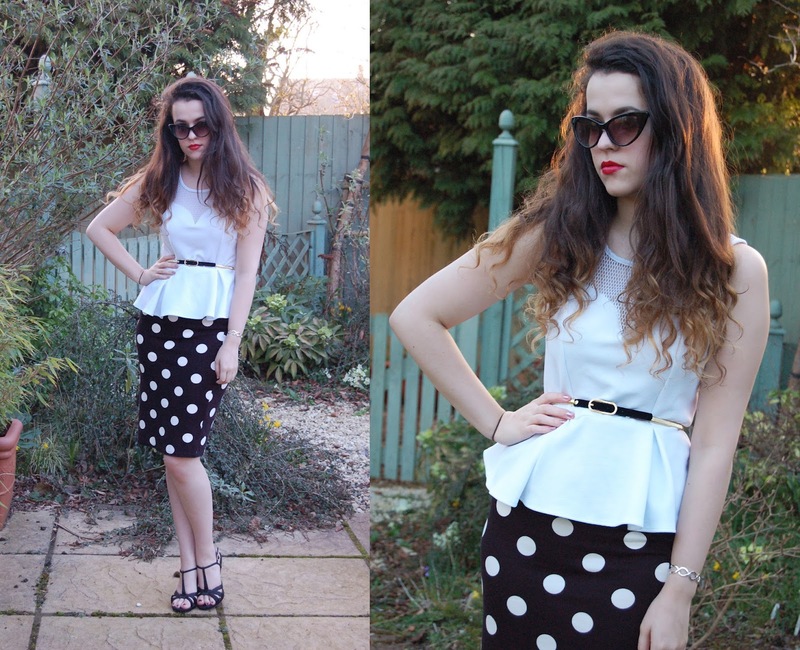 Love that peplum top! The detailing around the collar is great! Big fan of the peplum top and polka dots, very chic! Wardrobe tour post sounds brill, love being nosey! Love peplums so much, you look lovely. And yes yes yes to a wardrobe tour! Such an incredible outfit! <3 I always love cats eye glasses - so gorgeous! Congratulations on the web address! Lovely outfit, too. I love your sunglasses. Beaut outfit. The shades are amazing! I recently bought a domain- purely because I wanted to change my blogspot address and nothing available was really relevant and I realised I could buy the actual domain I wanted for next to nothing! Perfect sunglasses, I like your style! Ooh, I love this look! Just as much as I'd love looking round your wardrobe, I'm sure it's full of beautiful things!